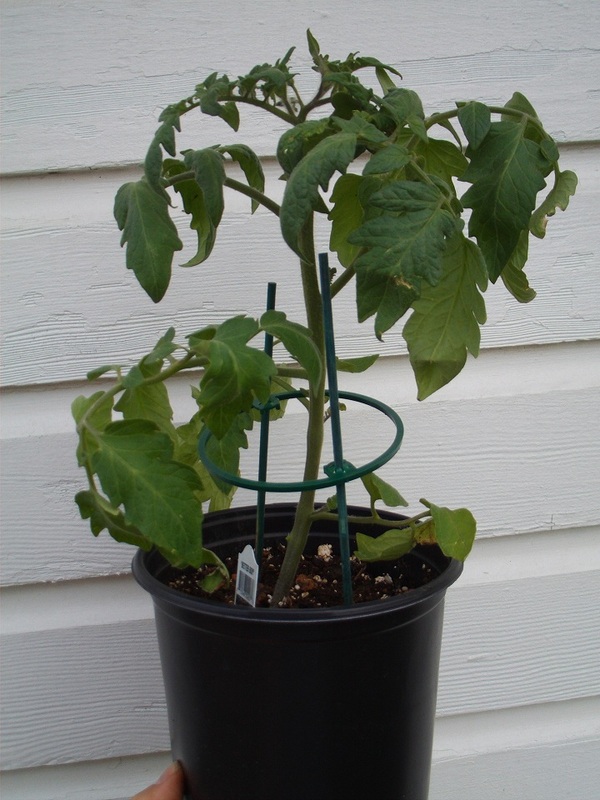 This is a Public Service Announcement to all backyard vegetable gardeners: if you have bought or are thinking of buying tomato (or pepper, for that matter) transplants at your local big box store or nursery, please be advised that it is highly inadvisable to plant such transplants in the ground for at least another 2-3 weeks. Don’t let this warm weather fool you – the nights are still getting chilly, and these heat-loving plants will not be very happy in the cold. If you plant them too early, you risk stunting their growth and fruit production, at a minimum. In the case of a hard frost (still quite possible), plants could downright be killed. As it happens, I rescued this Better Boy from the trash following the White House Egg Roll. Jon and I were limited in the amount of stuff we could carry home on the Metro, and so this baby was a candidate for being left behind. Because of my sympathy for plants and inability to willingly ‘off’ them (Case in point: my ‘Planticide‘ post), I dropped it in a tote and safely schlepped it home, all the while wondering what the heck I was going to do with it for the next month. In at night, out during the day, in at night, out during the day…what a pain! I admit I’m a little peeved at the stores for selling the plants so early. It’s kinda like seeing Christmas decorations in October…. Anyway, for reference, here‘s a swell planting calendar developed by a Master Gardener from the eastern shore. You have to scroll down the page to ‘Vegetable, Fruit, and Herb Gardening’, and then it’s the “Spring Planting Guide for Vegetables: A Dynamic Chart for Maryland Gardeners” Excel spreadsheet. Open it to enter the last frost date for your area (about April 30 for central Maryland), and recommended planting dates for specific crops will be calculated. For a less-sophisticated rule-of-thumb, use the Central Maryland Mother’s Day rule. By Mother’s Day there’s virtually no chance of frost, so you’re safe to plant your warm-season crops that weekend. So go out and plant Mom’s veggies with no fear! ← Berry Patch: Grow strawberries again? I store “too early” plants by putting them in their containers in a bucket–five or six per bucket if the containers are small. I add a quarter inch of water a day–just enough that all the bottoms of the containers have access and won't dry out–and keep the bucket on the east side of our house so the plants don't sizzle on hot days. If cold threatens, I carry the bucket into our garage for the night. Yes, two-thumbs down for nurseries that sell warm-weather veggies a month too early! Went to a big box store at the beginning of April, just after the last week-end of March, for a thing not related to gardening. Stop by the garden center just by curiosity. Because of the warm weather, all the warm season plant were gone !!!!! The only thing left, was some tomatoes plants with frost damage. Remember, we got 30*F in central Maryland during the last week of march. What did you think happen too in the two first weeks of April ? Low 30's*F again. No good for a warm season. Warm season crop at the beginning of March or even at the end of February like I see this year, it's like Christmas in August; way too early. a) still cool nights stunting growth? b) possibility of another hard frost? I can understand (a) but the risk of (b) is significantly diminished – we are certainly past the median last frost (historically speaking), with little current risk of it forecast in the next 10 days, and after that, history suggests that chances rapidly approach 0. But in any case, the veggies certainly did seem to appear quite early at the big box stores this year! In my opinion, the answer is (c). We are, indeed, past the median last frost for central Md. How much of a betting person are you? That's what it boils down to regarding the frost date. If you do want to plant now, you can try covering the plants at night with a plastic bag or row cover and that will protect them. But generally the plants won't grow a lot if it's too cool, anyway, so why bother? Just buy the plants in May and put them in the ground then. That is, if there are any left. I'm seeing a lot of warm weather plants being planted at the community gardens. People tell me that if it weren't time to plant them the stores wouldn't have them. I try to educate our clients by telling them that while day time temps may be in the 70s, the more important temperature is the nightime low. Nightime lows below 55 degrees cause tomatoes, peppers and eggplants to stall their growth, so planting early really doesn't create earlier tomatoes and can cause reduced production. Not an issue of buying them for me… all my tomatoes and peppers are from seed this year, and some of the tomatoes are already getting pretty big, but I don't think that a couple more weeks under the lights will do them any harm. Re: too-early stocking of warm-season plants in big box stores. Yeah, it IS just like Christmas ornaments in October. Every store, be it big box or garden center (where the owners and staff know better, but must keep up with competition and customer demand) wants to be the first to get in the next season's must-haves. As result of the upsurge in interest in the pleasures and rewards of growing-it-eating-it, eager novice veggie growers (and other eager not-so-novice gardeners worried about finding the cupboard bare when we get to it) get excited with the first warm days.That demand has produced the too-early tomato phenom. I get an ear-full every year on this subject from friends who own a large garden center, who feels compelled to buy too early for producers who start their plants to early, etc etc. But by the same token, it's demand that has finally brought pansies to garden centers and big box stores in fall, something that didn't happen until people became more aware of the possibilities. Let's hope the warm-season veggies will settle down a little in time to more realistic timetables!